What does it take for you to try something new when it comes to lures? I suppose it depends on many factors - the 1st one being experience level which depends on seeing different lures catching bass. My versatility didn't increase dramatically until I joined a bass club and then rec fished with different members. Until then my choices were few: plastic worms or grubs. Spinnerbaits, skirted jigs, Spooks, crankbaits, etc., I only saw catch fish on different TV shows or read about in magazine articles. But when I observed fishing partners catching fish on lures I had never used, all I can say is, seeing is believing ! But even though I saw a lure catch fish, didn't mean I knew how or where it was used. Most lures have limitations within their category and where they can be used best. Topwater lure uses are obvious - on surface or near surface only. So if I see someone get a bass on a PopR, I have to take into consideration where it caught bass: depth range, cover proximity or none, time of day, which months. So in a sense it's not just simply seeing someone catching fish on a lure for the first time, but the other factors that fine tune its usage. The first time I saw my tournament partner catch many small bass on a jig & pig 20 years ago, I had no idea what he was casting to since he shut off the rear sonar unit and made long casts into open water - or so it seemed. He was a very competitive secretive type and only after the tournament did I learn from a friend that he was casting to a shallow rocky hump surrounded by 15' of water. Again, seeing someone catch bass on a lure doesn't mean one knows the depth range and structure it is effective. Of course, I vowed to catch fish on that lure in a local bass lake even though I had a hard time believing a bass would strike something so dang unnatural looking! First time out - seven bass ins water from 4-12' near a rocky point; after that, I only used the j&p in similar waters not realizing the greater uses and trailers possible. Granted, I've posted many pictures of lures on this and other forums that I caught hundreds of fish on - 6 species no less!, but the waters I fish and the way I fish those lures may not be good for everyone in the waters they fish. Presentation is half the battle - location the other half, but only if the lure action, size and vibration is within a range bass will bite in that water, various times of day or in within certain months. Re: What does it take for you to try something new when it comes to lures? Frank I very much enjoy reading your posts as thought & experience go into your posts. It takes me first of all is it something I feel or will feel confident using. Then I purchase it and give it an honest try to use. I usually take a wait and see approach until a lure has proven itself. I'm definitely not an early adopter usually. Trying out new lures is a choice we all make at one time or another. I have found that I like to experiment and try different combinations. Mix it up and sometimes I make the right choice or combo to score on the bass. Sinkosam in your post you are very knowledgeable and write with authority on your material. It is a welcome site and pleasure to read. Continue with the good work. First off, I don't ever want to come across as preaching ideas; I discuss ideas and offer a different point of view for anyone interested to consider based on discoveries that proved to bare some truth regarding fishing for any species. When I say any species, I mean bass, trout, panfish, some salt water species, pickerel and walleye that have been caught with using lures supposedly not meant for them. What I've found and continue to find are lures that are different in some way than the usual selection sold. That in itself forces me to consider using new designs, modifications and sometimes bizarre looking lures pretty much forever. At present, soft plastics are my media of lure design and the easiest to make and then duplicate once proven on different outings and waters. Photo logs of each outing per each water fished, are recorded proof that something worked or worked with a different presentation. When I can catch five species in one day on one lure, that tells me that those fish aren't picky nor capable of being picky when the right lure is used the right way, but only if the strike energy level is above zero. The higher it is, the easier it is to provoke a fish - any fish to strike. That level must be high for a fish to strike a surface lure or to attack a moderately fast moving spinnerbait. But the nice thing about using lures that work when the level is low (suspending fish just hanging out for example), are the sheer variety of lures that catch more fish more times. 3. have profiles fish are apt to attack (Chatterbait isn't one of them) when given enough time for fish to inspect, become irritated by and then strike. (Hunger as a reason IMO is a human reason fish strike lures. My theory is strictly sense oriented (vision, lateral line) and stimulus provoking. It's fine to use only a few lures to catch fish one has confidence in and with certain presentations. But as with anything, variety is the spice of fishing - at least in my book, and if I can catch fish on a dozen different lure designs on one outing, that's what I'll strive to do. I might find a crankbait bite, jig bite and mini-soft plastic bite all on the same lake at different times. If successful, it means the lures were right for the strike energy level fish possessed at that moment. It's like winning the lottery when that happens! The more lures I have confidence in after they've proven themselves, the less reason not to change just for the H of it! grub bodies attached using a candle flame and hand poured mini-sticks worked wacky style and the usual jighead at one end. This example demonstrates how one idea led to many others and an increase in variety involving shape, thickness, length, color and rigs that equated to a universal species appeal and aggression. If there's any reason to try new lures or retry old ones, the above is reason enough! If you start catching numbers of fish, I'm sending you a bill ! The cost of lures is one factor for me, I’m just not into forking our hard earned cash for a high dollar swim bait LOL !! That’s a great question Sam, I’ll do my best to answer it, for me it has to be a quality bait for starters, take a simple jig for example, one off of the shelf at a wal-mart may be ok but one made by hand with quality skirting that’s been hand tied and utilizes a high quality stout hook, one that has the eyelet either taped off and lacks the color coat and or an eyelet that is coated but does not have the opening sealed shut from the coating, the little bit of extra work and attention to detail is what gets my attention, I’ll pay the extra few bucks for something like that and not think twice about it. When I do try a new bait, whatever that may be, early on I used to see the pros catch monster fish and think to myself, THATS THE BAIT FOR ME!!! That’s just not the case anymore, ususally these guys put these baits in the best areas of lakes known to have large populations of bass without much fishing pressure, that is something we tend to overlook in a lot of cases. When I purchase a new bait I don’t just throw it once or twice and say this thing won’t catch any fish, I generally hold on to it and and try to give it a go in lots of different scenarios, I purchased a buzzbait once and tried it for I don’t know how long before I finally got it to work in an area, I bet I had that thing for almost two years before I caught my first fish with it, I discovered something that day. Conditions, conditions have to be right for that bait to work, a slight chop to the water is preferable, a slight stain in water clarity is helpful, some sparse vegetation or isolated vegetation I guess I should say was key, the other important factor was the weather, we were the fourth day after a front had moved through, the water clarity prior was little to no visibility, when I look back on it now those fish were in a lock down mode prior to that due to the sudden change in their environment. We can not as anglers just dismiss a bait simply because we try it once or twice and have not caught anything with it, we must be vigilant in paying attention of their environment changes and how it effects their behavior. We must try it in different bodies of water also in situations that you believe you have a viable opportunity to attract some aggressive fish. As always Sam, your posts are spot on and very informative, great job !!!! I purchased a buzzbait once and tried it for I don’t know how long before I finally got it to work in an area, I bet I had that thing for almost two years before I caught my first fish with it, I discovered something that day. 1. paying attention to environment changes which equates to where fish are hanging out that year or month which defines a pattern of sorts. For example, in the northeast, rain, rain and more rain has changed everything regarding where fish have accumulated. (As Perry says, fish are in 10% of the lake most of the time.) When there was a drought, fish were much further from any bank and much of the time grouped near steep drops and near humps far away from shore. Now that rainfall has averaged way over the usual, fish are in the pads in water that was 2' and is now 4'. That small difference in lake depth can make all the difference! Same here! Sometimes I wish someone would bribe me to give a lure a fair chance and not just once, but many times. Granted, some lures just don't cut it which is why they end up in the clearance bin. But though some lures are limited when and where they catch fish (IE your buzzbait example) doesn't mean they can't catch fish other than because of sheer luck and a high aggression level that would make a bass strike a hot dog. Five years ago I found a soft plastic that had the shape of a bullet: tapered end with round parallel sides. No idea when I made it or when I put it in the box. But for the heck of it I rigged it on a light jighead and proceeded to catch fish after fish including 4 species. Confidence in the design was permanent from that day on and has been used to catch hundreds of fish annually. I have found that I like to experiment and try different combinations. Mix it up and sometimes I make the right choice or combo to score on the bass. Example: I add skirts to jigs and spinnerbaits as well as experiment with different trailers. Having caught fish on those lures with less skirt material and tried different trailers (trial & error method) I know have done well, I'm not restricted to using lures right from the package. 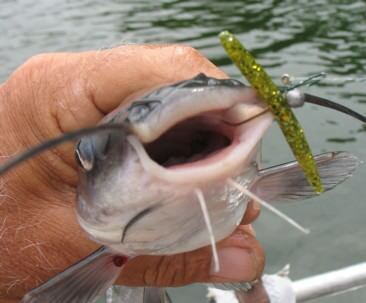 Plus, I can note variations and modifications of a lure that expand its use. Size matters! meaning: a lure of a certain size may work some of the time, but one a bit smaller in size for example may work better and for one simple reason: Noting what a difference in size does to a lure's action and the type of retrieve and speed best suited to any change. Bigger fish/ bigger lure must always be kept in mind, but as with any lure size, presentation must usually conform to that size as well as any hardware attached to it. But at times bass may be more prone to striking smaller lures of the same design that are more subtle in action. All of the above are from personal experiences and observations going back 45 years and waters fished in different states and different waters within a state. I read BassMaster magazine (life member) and rarely find anything of use I don't already know or can use. Some may relate to the opinions related by example and actual experiences, some not. But forums are there for the exchange of ideas that may lead to more ideas that increase one's success. Open minded readers can make all the difference, whereas a my way or the highway type of moderation always restricts ideas to lure company sponsor plugs. Is it too many lures or not enough.